Astrophotographer Roger M. Marty snapped the aurora north of Poker Flats, Alaska, January 22, 2012. 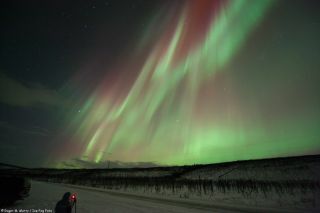 I've seen the northern lights just once, on a trip to Alaska with my dad nearly 20 years ago. Now I'm back in The Land of the Midnight Sun for a better, and much closer, look at this stunning atmospheric phenomenon. I got into Fairbanks Monday afternoon (April 9), and I'll spend Tuesday and Wednesday tagging along with a group of scientists who are launching dozens of weather balloons high into central Alaska's northern lights displays (which are also known as the aurora borealis). The expedition is called Project Aether: Aurora, and it aims to snap high-definition photos and video of the northern lights from their very edge, about 19 miles (30 kilometers) above the snow-covered Earth. The researchers plan to augment this imagery with footage captured from terra firma as well as from the International Space Station, which zips around our planet at an altitude of 240 miles (386 km). The team is counting on the dramatic beauty of those photos and videos, along with the sense of adventure pervading the expedition, to get kids hooked. And there is adventure, too: Researchers are using dogsleds and helicopters to retrieve balloon payloads that fall back to Earth far from accessible roads. The auroras themselves are similarly exotic to me. I know they result when charged particles from the sun collide with molecules high up in Earth's atmosphere, generating the famous glow. But staring up at the dancing, flickering lights — or even just looking at a really good photo of them — can instill a sense of wonder and mystery, one perhaps akin to what the ancients felt when craning their necks skyward long ago. I'll be chronicling Project Aether: Aurora's activities over the next few days, providing updates on the expedition and my own small role in it. If I pitch off that dog sled and land face-first in a snowbank, you'll get to read about it — and probably see some embarrassing photos as well.